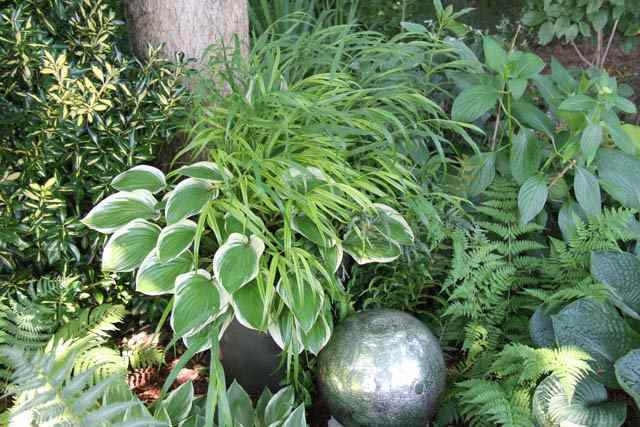 Have you considered using a hardy grass as the focal point of a container? We have used several varieties of Miscanthus, Calamagrostis and Hakonechloea very successfully. Each fall we remove the clumps from the containers and dig them into the ground for the winter. We cover them well with a thick layer of shredded leaves or straw. In the spring when the ground starts to warm up, we dig up the clumps and put them back into their containers. Because they are already well established, they shoot up quickly and make a real impact in a very short time. It sure beats the high cost of buying annuals!